SAN NARCISO, Calif. (Bennington Vale Evening Transcript) -- On Wednesday, after nearly a month of speculation and circular arguments, FBI Director James Comey staunchly defended his bureau’s claim that North Korea orchestrated the cyber-attack against Sony Pictures in retaliation for its film “The Interview,” which depicts a farcical attempt by two American entertainment journalists to assassinate Kim Jong-un. The U.S. government has endured weeks of criticism from cybersecurity experts who believe the attacks originated from a source inside Sony. Comey responded that these private-sector lackeys “don’t have the facts that I have.” Regardless of where responsibility for the hacking falls, government officials feel confident that the evidence will point to a foreign source. “The U.S. government has spent so much of its time spying on American citizens that if the attacks came from Sony, we would have known about it long ago,” Comey stressed. The FBI’s press statement this week marked the most detailed explanation the bureau has offered since it first concluded the existence of a link between the cyber-attacks and Pyongyang. Comey said U.S. investigators traced emails and Internet posts sent by the Guardians of Peace, the group behind the attack, to IP addresses used exclusively by North Korean servers. Cybersecurity analysts, however, remain skeptical of the FBI’s assertions, describing the evidence as nothing more than circumstantial. 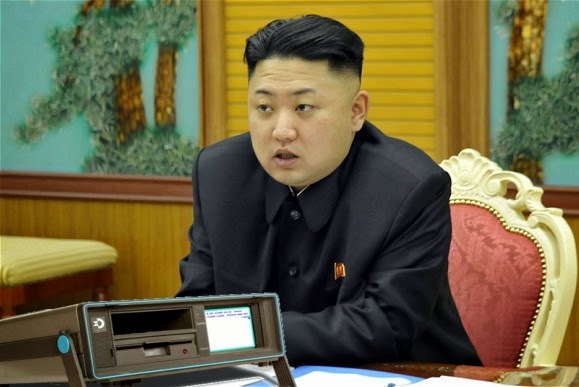 “It’s very difficult to believe that North Korea has the resources or the know-how to pull off a computer attack with this level of sophistication,” said Stan Devry, chief IT security officer for the Galatronics Division of Yoyodyne Inc., a multinational defense contractor based in San Narciso County, Calif.
North Korea, of course, blamed the United States. One official from the National Defense Commission resorted to racial epithets when blaming President Obama for the outage. “Obama always goes reckless in words and deeds like a monkey in a tropical forest,” the spokesman for the commission said in statements carried by the country’s state-run news agency, KCNA. Republican officials in the United States denied that the Obama administration had anything to do with the Internet failures in the DPRK, but agreed that the president, who was vacationing in Hawaii at the time, did resemble a monkey in the jungle, and that North Korea’s statements were likely astute observations rather than bigoted slurs. Still, Comey and his NSA counterparts stand firm in their conclusions that the cyber-attacks came from North Korea. “Along with the NSA, we’ve been listening to calls and reading emails of every American since 2000. If the threat had taken root in the United States, we would have already apprehended the culprits and sent them to the CIA for enhanced interrogation,” Comey insisted. Beginning in 2000, after recognizing the pivotal role the Internet would play in the lives of every individual, the National Security Agency (NSA) began investing billions of dollars into a clandestine initiative to extend its domestic surveillance programs across the World Wide Web. Its programs have since expanded. But this has only led to more criticism from experts in the private sector.